“20 years are not enough” - Unite against Deportation and Social Exclusion! With your solidarity donation you prove the power of unity in the movement. 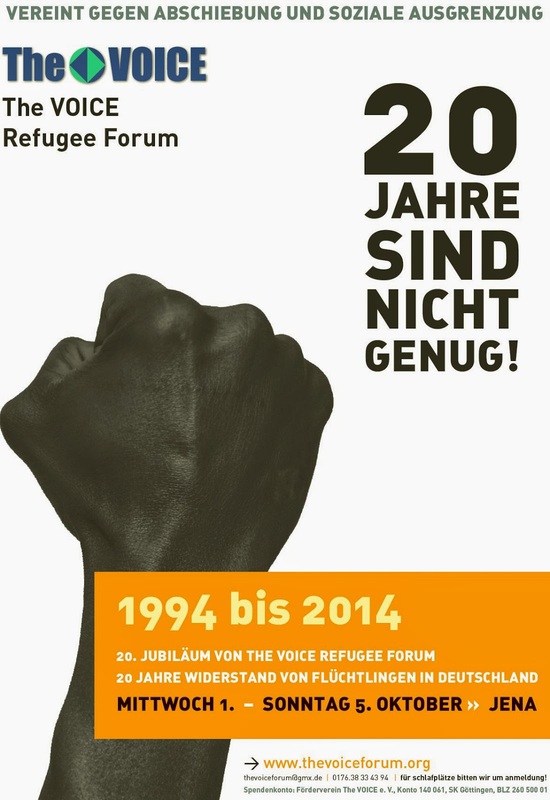 The VOICE Refugee Forum calls for anniversary of 20 years resistance and struggle against German racist laws by which the persecution of refugees is legitimized and socially normalized. Deportation is a proof of accepted existence of state crime, which we identify as our main target to resist. These keywords are result of 20 years activity against isolation and deportation practices that are the two hands of the elimination culture. Deportation is the continuity of slavery business. Financial independency from government guarantees the continuity of a self-empowered movement. Fake alternative applying system is no alternative as it does more to undermine our self-determination. It devalues our information, disregards our human dignity and imposes a control mechanism just by keeping us in a race, taking our energy, wasting our time. We ignore this usual and formal way which controverts the demand for independency. We call for our political and financial autonomy in our fight to develop and empower our demands for the next generations. It is possible if all contribute to it. and implementing the five-day event. 750 times 20 Euro would reach this sum. 750 times 20 Euro for 20 years of existence of The VOICE Refugee Forum against deportation and social isolation - for self-empowerment and active resistance in unity and solidarity. We welcome your contribution to 750 times 20 Euro – but we welcome also any lower and higher donation!